If Marie and Catherine are unusual, it is only because of Catherine’s age. In 1992, the year she was conceived, there were just 1,802 attempts by women to become pregnant using someone else’s eggs, according to the Centers for Disease Control. Three years later, there were more than 4,738 such cycles; by 2004, the most recent year for which data has been published, there were 15,175 cycles, resulting in 5,449 babies. By comparison, some 22,911 children were adopted from abroad that year, and although there are no official figures, one survey estimated that at least the same number are conceived annually via donor insemination. Donor eggs are now used in 12 percent of all in vitro fertilization (I.V.F.) attempts, making it among the fastest-growing infertility treatments. Despite the portentous hype around women like Frieda Birnbaum, a 60-year-old New Jersey resident who in May used donor eggs to become the oldest American to give birth to twins, the bulk of intended mothers are in their 40s. The birthrate among women ages 40-44 has risen 62 percent since 1990, while the rate among those in their late 40s has more than doubled. Among those who used I.V.F. in 2004, about a third of the 43-year-olds used someone else’s eggs; by 47 years old, 91 percent did. 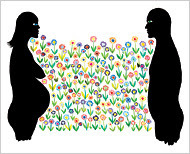 With egg donation, science has succeeded in, if not extending women’s fertility, at least making an end run around it, allowing older women who, for a variety of reasons (lack of money, lack of partner, lack of interest, lack of partner’s interest) didn’t have children in their biological prime — as well as younger women with dysfunctional ovaries — to carry and bear babies themselves. It has given rise to the mind-bending phrase “biogenetic child,” meaning a child who is both biologically and genetically related to each of its parents, by, for the first time in history, separating those components. In that way, it is fundamentally different from sperm donation, though it also levels a certain playing field: mothers can now do what fathers always could — conceal the truth about their blood relationship to their children. And as with any new reproductive technology, it has provoked a torrent of social, legal and ethical questions about the entitlement to reproduce, what constitutes parenthood, children’s rights to know their origins and the very nature of family. Then again, with a donor egg, I could feel a baby grow inside me, experience its kicks and flutters. I could control — that sweetest of words — the prenatal environment, guard against the evils of drug and drink. I could give birth to my own child, breast-feed it. After a year of discussion, my husband and I decided to go ahead, only to find that, when placed in a petri dish, his sperm and my friend’s eggs refused to tango.